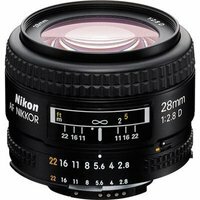 A standard Nikkor wideangle lens for general photography. It is exceptionally light - weighing only 205g (7.4 oz) and its 74 degree angle of coverage lets you take candids, portraits, and travel photographs. Accepts 52mm filters.